If there is one thing liberals and conservatives can agree on, it's that government doesn't work quickly. Unfortunately for us in the entertainment industry, there is important legislation being talked about now that actually requires the issue to be resolved by 2009, and this is not one that can be rushed. 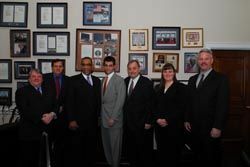 The "White Spaces" representatives from left to right: Richard Fitzgerald, Sound Associates; Bob Rendon, PRG Audio; Representative Bobby L. Rush (D-IL); Geoff Shearing, Masque Sound; Paul Gallo, PAMA; Danielle Burt, Bingham McCutchen LLP; Jeff Krull, Shure Inc. I'm referring to the Wireless Innovation Act of 2007, introduced in a bipartisan effort by Senator George Allen (R., VA), and cosponsored by Senator John Kerry (D., MA) and Congressman Jay Inslee (D., WA). This broad reaching legislation is associated with the government's move from analog to digital television by the year 2009. Digital television or DTV, will occupy the same frequencies as previous analog channels from two to 51 with any unoccupied spaces or frequencies out of this range available to the public for use with any unlicensed devices. An unlicensed device or UD is a broad term including fixed and portable devices that will transmit or receive a wireless signal. Proponents of UD's are some of the heaviest hitters in the telecommunications and computer industries including: Microsoft, Intel, Google, Dell, HP, Qualcomm, and Alltel. Interference concerns are widespread throughout many industries including TV broadcasters and most importantly to those of us in the entertainment industry, microphone manufacturers. Currently wireless microphone technology mostly exists on VHF frequencies between 174Mhz and 216Mhz and on the UHF band between 470Mhz and 806Mhz. These are considered "white spaces" within the current analog TV spectrum, or in other words, the spaces between channels. If the current legislation passes as it is now written, then these frequencies will be opened up to interference from an array of unlicensed devices. To complicate things further, in an attempt to stop interference between multiple UD's many of these products will be operating on multiple frequencies simultaneously to ensure a constant connection. Wireless microphone signals are low-powered, usually 50mW, and are not continuous, which makes then considerably more difficult to detect by these "hopping UD's." The major argument by those interests in the microphone industry is that there is insufficient time to show that these products can operate within their frequency spectrum and not create interference. Included within this legislation is the statement, "to permit unlicensed, non-exclusive use of eligible frequencies between 54Mhz and 698Mhz at the earliest technically feasible date, but not later than February 18, 2009." Essentially this means that if this bill passes, and these interference concerns are not dealt with by February of 2009, then the frequency floodgates will open and the FCC will have no control over the area within which all of our industry technology currently resides. Groups such as the Professional Audio Manufacturers Alliance, whom represent over 80 percent of the U.S. market, have filed with the FCC asking for more, "time to fully test and then implement a policy that restricts harmful interference from consumer devices without disrupting the public and broadcast events that today's wireless products serve." However, the cries of our industry may never be heard over the roar of interest the telecommunications industry has shown over this legislation. Senator John Kerry has stated that the FCC, "seems intent to inexplicably drag its feet on this measure." Many proponents of UD's say that these interference concerns will be addressed by spectrum sensing devices developed by the manufacturers. However, currently there are no commercially available spectrum-sensing devices for the TV band. Microsoft has submitted to the FCC a radio and transmitter that recognizes signals in the TV spectrum but it is far away from being a commercially viable solution Lobby groups for the microphone industry such as PAMA argue that interference concerns relating to fixed UDs should be addressed first and that, "It is premature for the Commission to split its focus and consider the more difficult case of personal/portable UD operation." The solution these groups have posed is to set aside specific frequencies in which microphones can operate free from interference and, "require UD manufacturers to prove conclusively that spectrum sensing works effectively in real world conditions." To get a perspective on where the manufacturers are along this process I asked Mark Brunner, senior director of public relations at Shure Incorporated a few questions concerning the future of wireless microphones. R&SS-If the current legislation passes as it is written now, what's the next step in wireless microphone development to combat the interference problems that will arise? Brunner-The difficulty with these bills for wireless manufacturers is the lack of specificity regarding actual frequency ranges that would be affected and the operating characteristics of the new devices. This is why Shure has lobbied to allow the FCC proper time to test new unlicensed devices and to determine a workable allocation of the RF spectrum. Historical development efforts to improve scanning capability as well as antenna, cable and combiner designs for wireless microphones will certainly continue and help maximize system performance under adverse conditions. Additionally, future system designs will likely focus on flexibility and adaptability to help users navigate crowded RF environments. Lastly, once final rules are written, manufacturers will produce products that operate in the frequency ranges that have lowest potential for interference. How long has Shure known about the potential for the government opening up their frequency range to unlicensed devices? Shure has been actively engaged in the white spaces unlicensed dialogue since 2003. In fact, since that time, we have filed over 40 formal documents to the FCC and made multiple trips to the Commission and to Capitol Hill. Spectrum issues are typically lengthy studies and schedules are often extended, as evidenced by the DTV transition. However, the FCC's November, 2006, Notice of Proposed Rulemaking and the arrival of the legislation previously mentioned were signs that the government was moving from the exploration phase into the action phase. And although there still are many complex issues to be resolved, we felt it was important to fully engage our customers and lead users on the topic at this critical time. The result has been an outpouring of real world testimony that has illustrated the complexities of coordinating wireless audio in our content-rich society and given pause to policymakers. Most notable of these is Congressman Bobby Rush, who introduced a House bill that counters the Kerry, Sununu and Inslee legislation by calling for extensive testing of new devices and an extended time period for their introduction into the TV bands. Support for the Rush bill is steadily increasing, particularly from his peers who represent entertainment hubs like Las Vegas, Nashville and New York. With Shure being the number one microphone manufacturer on the planet with money for R & D to combat these interference concerns, do you think this will limit smaller manufacturers from getting into the wireless market? Certainly healthy R&D budgets are helpful in addressing transitions in technical markets. However, innovation is not the privilege of the large. In fact, smaller companies often benefit from a sharp focus on product and technology issues that have the potential to greatly impact their business. Also, as wireless audio becomes more ubiquitous, the smaller firms will see new opportunities to address niche markets that have highly specific needs and cost models. We believe the future landscape of wireless professional audio will be shaped by the innovations of both the large and small players, as it has been to date. Would you agree that the first company to come up with a viable solution to this problem, that allows for the level of reliability the industry is accustomed to, has the opportunity to gain huge market share. First mover advantage is meaningful in any market, and professional audio is no exception. However, it has been our experience that this advantage is not permanent. Competition is heavy in this business, and with the multitude of strong companies producing wireless products for pro users, all will likely continue to respond to the advances of the others with their unique approaches to elevating product performance. But technology is not the only answer to this situation. That's why Shure is balancing its technology investments with increased customer support and education and, of course, our ongoing efforts to affect public policy on spectrum allocation. We must be successful in all three areas to maintain the level of reliability the industry has come to expect. As Shure is synonymous with reliability for many in the pro audio industry, we intend to meet this goal. It seems that it is only matter of time before some version of unlicensed devices becomes a part of our technological culture yet the question remains, will the manufacturers in our industry be able to withstand the technical hurdles to guarantee the product reliability that all of us have come to expect? Perhaps we will be thrown into the mix with all the other wireless products to come, and the days of 150 channels of RF may soon be gone. But companies like Shure will be working to ensure that doesn't happen. Get involved and show your support by contacting your Congressional Representative and ask them to support the Rush Bill - HR1320. In the past few months, Shure has made significant contributions in preserving the "White Spaces." In late January, representatives from Shure joined others from the Grand Ole Opry, the Sports Video Group (SVG), the Professional Audio Manufacturer's Alliance (PAMA), and several nationally known producers and audio engineers in Washington, D.C. to discuss the issue with legislators. The group of audiophiles expressed concern about the introduction of unlicensed devices in television broadcast bands unless FCC rules are created that will protect wireless microphones. Senators John Kerry and John Sununu expressed similar concerns. Jeff Krull, vice president for product development at Shure said, "Our group wants to ensure that wireless microphones are protected from potential interference. FCC rules that do not allow for the successful coexistence of unlicensed devices would also significantly harm the greater public interest. Any interference could cripple the production of live, high-profile events like the Super Bowl, World Series, GRAMMY Awards, Broadway shows, and political conventions to name a few." A couple months later, House Representative Bobby L. Rush introduced H.R. 1320, The Interference Protection for Existing Television Band Devices Act of 2007. The legislation allows fixed, unlicensed device use of the "white spaces" between broadcast television channels (between 54 MHz and 698 MHz) after the national transition to digital television broadcasting in February 2009. It also requires unlicensed device manufacturers to demonstrate that their device will not interfere with existing "white spaces" products, including wireless microphone systems. Moreover, the proposed Rush legislation only permits portable (mobile) unlicensed device use of the "white spaces" after the fixed devices operate for three years without causing interference. In addition, portable device manufacturers must assure non-interference from their devices through thorough engineering analysis, design, and testing. Shure's president and CEO Sandy LaMantia endorsed the bull and called it, "an astute and balanced approach to the so-called 'white spaces' debate in Washington. It promises the continued development of new technologies without creating mass disruption in the production of major entertainment, religious, sports, and news events." LaMantia continued to say that Shure would be on the forefront for this legislation. "Shure will continue to communicate to all of our customers across the nation, focusing a great deal of our support for the Rush legislation in the major metropolitan areas that are home to so many of these important applications for wireless systems. I would expect legislators from every major metropolitan area to be very interested in this bill based on their constituent reliance on wireless microphone technology." For more information visit www.shure.com.